This module allows for the creation of Employees, Assets, Departments and Divisions. In each section click the appropriate New button to create the item. Employees can be added, edited and deleted using the Resource Register. Employees can be edited by double clicking on the row to launch the Edit Employee window. All details can be edited except for the HR ID. After any changes have been made click Save Item to save the changes and close the window. To create a new employee click New Employee. This launches the edit employee window. All details can be completed. Clicking Auto Number completes the HR id with the next available value in sequence. An employee can be deleted by selecting them from search results and clicking Delete. The department employees are allocated to can be updated by selecting the employees to update from the search results. The new department is then selected using the Find link. When selected from the Find Department window it populates the text field. Clicking Set Dept to will then update all selected employees to be assigned to the chosen department. Note: This will not update the cost centre allocation of any locations the employee is allocated to; this will need to be updated in the Floor Monitor exceptions tab. Assets can be added, edited and deleted using the Resource Register. Assets can be edited by double clicking on the row to launch the Edit Asset window. All details can be edited except for the Code. After any changes have been made click Save Item to save the changes and close the window. An Asset can be deleted by selecting them from search results and clicking Delete. 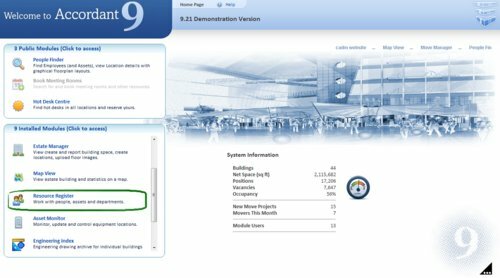 The department assets are allocated to can be updated by selecting the assets to update from the search results. The new department is then selected using the Find link. When selected from the Find Department window it populates the text field. Clicking Set Dept to will then update all selected assets to be assigned to the chosen department. Departments and Divisions can be added, edited and deleted using the Resource Register. The location filter has no effect on displayed result for department. Departments can be edited by double clicking on the row to launch the Edit Department window. All details can be edited except for the Code. After any changes have been made click Save Department to save the changes and close the window. To create a new department click New Department. This launches the edit division window. All details can be completed. The colour can be entered as the AutoCAD colour, or by clicking and selecting from the displayed colours. A Department can be deleted by selecting them from search results and clicking Delete. The division a department is allocated to can be updated by selecting the departments to update from the search results. The new division is then selected using the Find link. When selected from the Find Department window it populates the text field. Clicking Set Div to will then update all selected departments to be assigned to the chosen division. The location filter has no effect on displayed result for division. Divisions can be edited by double clicking on the row to launch the Edit Division window. All details can be edited except for the Code. After any changes have been made click Save Division to save the changes and close the window. To create a new division click New Division. This launches the edit division window. All details can be completed. The colour can be entered as the AutoCAD colour, or by clicking and selecting from the displayed colours. A Division can be deleted by selecting them from search results and clicking Delete. NOTE: Deleting a Division does not delete any attached Departments. These should be deleted or reassigned first.